Newark's 20th century hotel-building era straddles the Great Depression. On the early side, the Robert Treat Hotel opened in 1916, in time for the city's splendid 250th anniversary celebration sponsored by the influential McCarter family and the Newark Board of Trade. In 1922, the Newark Athletic Club became the Military Park Hotel. At the south end of Broad Street was the impressive Elks Club building, begun in 1922-23, which lasted only a short time as a club before it was converted into the beautiful Essex House. Across town on Clinton Avenue at High Street, the Riviera opened and was the last of the great pre-Depression hotels. Later it was converted into a religious-run hotel, which it remained until just recently. In 1931, the Art Deco-style Douglas Hotel opened. It is now an apartment house, but in the 1930s it was the City's Overnight Lodging Home, serving for a decade as a reception center for stranded travelers in a Depression-era city. Smaller facilities which are still remembered include the Elberon at 1007-1009 Broad St., the Tremont Hotel off Military Park, and the Park Lane Hotel on Lincoln Park at Pennsylvania Avenue. A review of the 1999 telephone directory lists the Courtyard by Marriott and Days Inn Hotel at Newark Airport, Highway 1 and 9; the Hilton Gateway at Raymond Boulevard and McCarter Highway; the Holiday Inn North, Newark Airport at 160 Holiday Plaza; the Marriott Hotels Resorts Suites at Newark Airport; the Parkhurst Hotel at 11 Lincoln Park, the Ramada Hotel at Highway 1 and Haynes Avenue and the Robert Treat Hotel at 50 Park Place. Almost as if responding to the 1860s editorial petitions for the construction of a great hotel in town, the Robert Treat Hotel came into existence as a result of the planning of the Newark Board of Trade and the influence of Uzal McCarter. 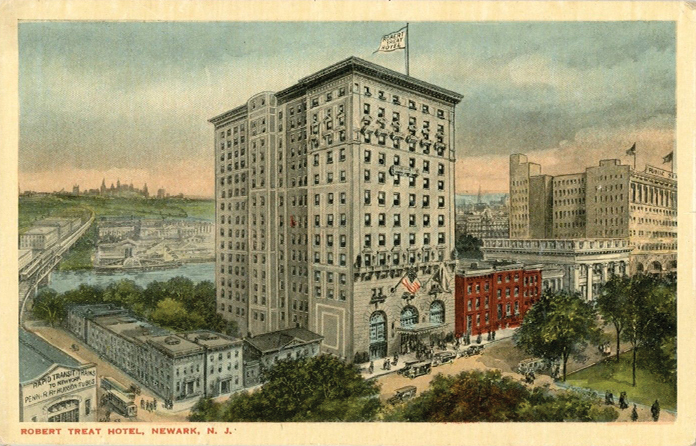 It was completed in time for Newark's 250th anniversary celebration in 1916 and was the first of the city's great new hotels of the 20th century. After several ownerships and renovations, it remains a major downtown business landmark. The Robert Treat Hotel was built on land owned by the Fidelity Trust Co. Construction was completed by the bank for the city's most memorable anniversary celebration, which included a visit by President and Mrs. Woodrow Wilson. The 14-story classical style building was designed by the Newark architectural firm of Guilbert and Betelle and constructed by the George A. Fuller Co. Its distinctive exterior is divided into six irregular bays, and the first four stories are described as rusticated. The rounded arch windows are embellished with cartouche and mask ornamentation. Above the third and four floors is a balcony festooned with relief panels. The building is crowned by an ornate frieze and projecting panels. The exterior is brick and stone. The exterior remains basically unchanged with the exception of an addition completed in time for the city's 300th anniversary in 1966. The interior has been changed considerably. According to an account in the Sunday Call of April 2, 1916, 'The main floor will equal anything that New York or any other city can boast in the way of a hotel. The spacious lobby will be a dream of massive and beautiful construction when the finishing touches have been put upon it by squads of mechanics who are working steadily toward completing it.' The lobby was filled with imposing columns, a huge fireplace, a painting of Robert Treat's landing, writing tables and tea tables. Its high ceiling was coffered and paneled and decorated in shades of dull gold, soft reds, blue blues and browns and dominated and the wainscotting of marble. Columns and pilastered walls were tinted in French Caen stone. The dining room had immense windows 75 feet square and was divided by glass partitions of ornamental design. The mezzanine balcony overlooked the dining room, which was in the Adams style. Furniture and decoration was mainly in the Wedgewood style and in cool colors of pale green, plum and gold. Marble wainscotting was found throughout the room, and large plants were scattered throughout the setting. At the far end of the floor were five private dining rooms, including the Robert Treat Gallery furnished in French gray. There was a Japanese dining room decorated in wisteria, and a green Chippendale room. A 75-by-75 foot ball room occupied the second floor decorated in maple in the style of Gibbons with a seating capacity of 600, and 1,200 for conventions. Above, there were 11 floors of sleeping rooms. On the fifth floor, the 'Presidential Suite' was first occupied by President and Mrs. Wilson. The Governor's suite was first occupied by Gov. and Mrs. Fielder. On the ninth floor, the McCarter Suite was occupied first by Mr. and Mrs. Uzal H. McCarter, the hotel's chief backer and great friend. E. I. Enterprises owned the Robert Treat in 1970. In July 1990, it was acquired by Miles Berger from the Quality Inn. About $5 million was spent on its refurbishing at that time. The original building and the adjoining office building are again undergoing extensive changes, and an upgrading of its conference and convention center has just been finished. Today, the building stands across the street from the New Jersey Performing Arts Center in the middle of a reviving Newark. The Newark Athletic Club, later the Military Park Hotel at 16-18 Park Place, was built in 1922 and operated as one of the nation's largest athletic clubs. The building was modeled after a larger counterpart, the Chicago Athletic Association Building. It was a 10-story, 7-bay rectangular structure with heavy classicizing elements on its main facade 'including a scroll bracketed metal cornice, and a first-story sculptured frieze of athletic motifs.' According to one account, the motifs 'disappeared after the old hotel's demolition. Unfortunately there is no record of what happened to the frieze that showed men playing lacrosse, hockey, football, baseball and other sports. However, the wonderful front entrance door surrounded by Corinthian columns has been carefully reconstructed on the front lawn of the New Jersey Performing Arts Center at Centre (Center) Street. The main body of the building, a reporter noted, is 'ornamented by rectangular panels and carved shield reliefs. It was separated from the attic by a frieze of ornamented windows and Doric pilasters.' The building was historically and architecturally important and included a bowling alley, swimming pool and bed chambers for members and guests. In 1943, it was converted into the Military Park Hotel. Its original architect Jordan Green, designed a building which served extremely well as both a private businessman's club and an important downtown hotel. After the hotel closed in the 1970s it was used as offices by New Jersey Bell, and its once-grand lobby was converted into Video Plaza. In May 1993, the 71-year old landmark was imploded to make room for the New Jersey Performing Arts Center. Before a crowd of 1,000 gathered on the 22nd floor of One Newark Center, eighty-five pounds of explosives brought down the once-glittering structure, which once boasted a grand ballroom, sports facility and 350 sleeping rooms. A national television audience watched on NBC-TV, as did hundreds of spectators gathered in Military Park behind police barricades. The final curtain had rung on this once-important local hotel situated just a few feet from where the first pilgrims had landed in May 1666.